Ocellius ring flaunts bold design and a showstopping center-stone. 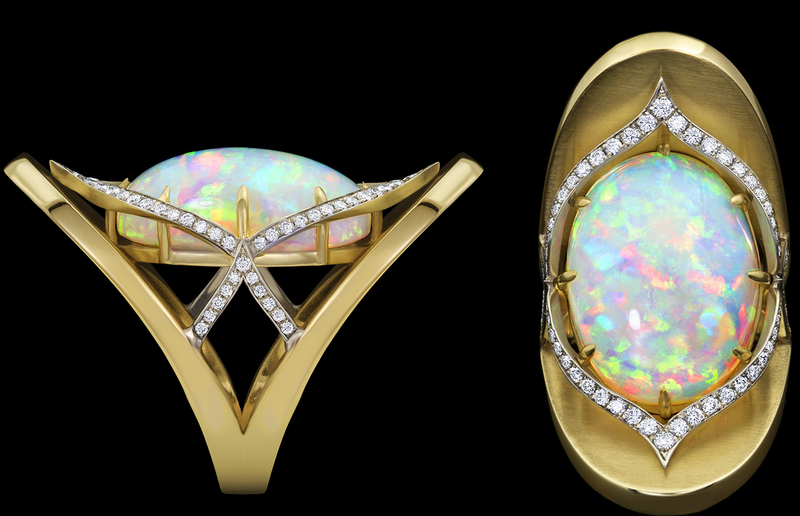 Sweeping lines of yellow and white gold accentuate and protect a beguiling 17.37 carat Ethiopian opal. Completed with accent diamonds. This one-of-a-kind piece is available. To purchase, call (949) 715-0953 or use our contact form below. For their lively light-play and rainbow colors, opals are unlike any other gemstone. One of four so-called phenomenal gemstones, opals exhibit a unique light interaction owing to perfectly ordered spheres of silica, which diffract light with a magical flourish. For their lively light-play and rainbow colors, opals are unlike any other gemstone. To purchase this piece or ask a question, submit this form and we’ll respond promptly. Inspired by the warm glow of a sunrise, Adam innovated to create AlbaGold™. This flattering new material is a signature alloy, available exclusively from Adam Neeley Fine Art Jewelry.